New Rochelle, the 1960s. 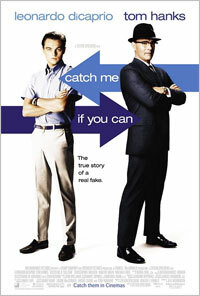 High schooler Frank Abagnale Jr. (Leonardo DiCaprio) idolizes his father, who's in trouble with the IRS. When his parents separate, Frank runs away to Manhattan with $25 in his checking account, vowing to regain dad's losses and get his parents back together. Just a few years later, the FBI tracks him down in France; he's extradited, tried, and jailed for passing more than $4,000,000 in bad cheques. Along the way, he's posed as a Pan Am pilot, a pediatrician and an attorney. And, from nearly the beginning of this life of crime, he's been pursued by a dour FBI agent, Carl Hanratty (Tom Hanks). What starts as cat and mouse becomes something akin to father and son. East 48th Street and Park Avenue, Manhattan. otsoNY Comments: As Frank first walks down the street in his Pan Am uniform, a Fedex delivery truck is partially visible in the background. Federal Express wasn't founded until 1971 and the Fedex logo on the truck was designed in 1994 when the company officially adopted the Fedex brand name. Also in the same scene, the pavement along Park Avenue is wet as the camera hovers above, but in the next scene, the pavement is completely dry. Park Avenue is a wide boulevard that carries north and southbound traffic in New York City borough of Manhattan. 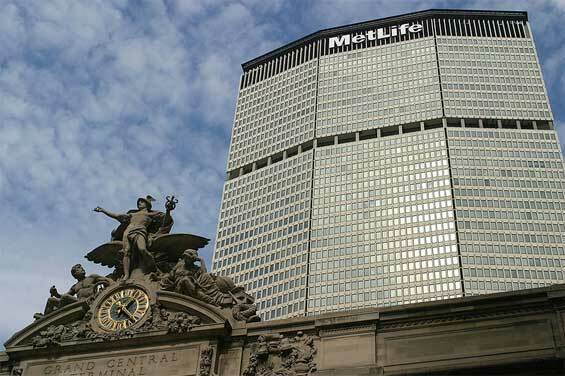 Throughout most of its length, it runs parallel to Madison Avenue to the west and Lexington Avenue to the east. The flowers and greenery in the median of Park Avenue are maintained by the Fund for Park Avenue. Begonias are a flower of choice for the Funds gardeners because there is no automatic watering system and they can cope with hot sun. Each December, Christmas trees are placed in the median. The first time they were erected coloured lights were used and accidents occurred because of confusion with traffic signals in front of them. Today only yellow and white lights are used. Park Avenue was originally known as Fourth Avenue and carried the tracks of the New York and Harlem Railroad starting in the 1830s. The railroad originally built an open cut through Murray Hill, which was covered with grates and grass btw 34th and 40th Street in the early 1850s. A section of this "park" was renamed Park Avenue in 1860. In 1867, the name applied all the way to 42nd Street. When Grand Central Depot was opened in the 1870s, the railroad tracks btw 56th and 96th Streets were sunk out of sight, and, in 1888, Park Avenue was extended to the Harlem River. In 1936 the elevated Grand Central Terminal Park Avenue Viaduct was built around the station to allow automobile traffic to pass unimpeded. In October 1937, a part of the Murray Hill Tunnel was reopened for road traffic. Efforts to promote a Grand Park Avenue Expressway to Grand Concourse in the Bronx were unavailing. On May 5, 1959, the New York City Council voted 20-1 to change the name of Fourth Avenue btw 17th and 32nd Streets to Park Avenue South. 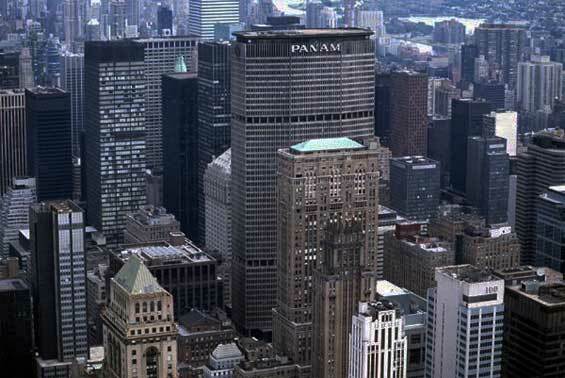 In 1963, the Pan Am Building was built straddling Park Avenue atop Grand Central Terminal, with a tunnel through it to accommodate the automobile bridge. otsoNY Comments: The Aston Martin DB5 that was seen in the movie was sourced by Autosport Designs Inc of Huntington Station, New York a specialist exotic car dealership. Dreamworks contacted Autosport Designs and asked if they could supply a silver DB5. However they did not have one in stock and instead contacted a customer and arranged for his car to be used. The car is the same make and model used in the James Bond movie Goldfinger (1964). East 50th Street and Park Avenue, Manhattan.